I have copied what appears to be an interview from leahs mom.. Cory Courtright. I copied the whole thread with maps, etc. & deleted links. PLEASE DISREGUARD ANYWHERE IT SAYS THAT THERE IS "NO DISCUSSION". THE WHOLE POINT OF MY BRINGING IT HERE IS TO DISCUSS!!! I find it very interesting that even up until about a year ago....the "FAQ'S" seem to have changed. ~NO DISCUSSION~You may have the information to solve this case. Please contact administrator with tips or leads. The main notes are by Chicagofa13 hope you don't mind us adding to them!! 28th June 2000 Weather Good , It gets dark from 9.45 onwards..
Leah is in a relation of 8 months with NM(split once in this period due to Cory concerns of his effect on Leah she was tearful and he was older ) ..Unknow to the family a school teacher Sharon Nelson , as stated physical abuse did appear in their relationship, she observed Leah on occasion hitting NM and he would respond in defense , and was known to have a flash temper..It as been noted that Cory had booked an appointment for Leah at a health clinc ?? , to discuss birth control.. In one affidavit it seems BB's girlfriend was also at the home < Unnamed GF, we have no info at all about this young lady ..
NM takes LF to SM's home 444 ½ Elm Street...We are told by Cory he was schelduled to return and pick Leah up around 9.00 pm.. The questions raised in the forum about the timing/reason of jog , have been cleared up by Cory's talk with SM : FACT They wanted to go for JUST a jog and it was no ruse to go somewhere .. The questions raised in the forum about going for a jog so close to Leah's lift : FACT The arguement between SM and her mother went on till close to 9 , but they had requested to jog earlier.. The assumption is she is walking back to her home on Knott Street..
9.00-9.15 NM shows up at SM's approximately 9.00/05 to pick her up and learns LF has left , it would appear they've missed each other by minutes.. He drives up Central to Knott and back again looking for LF,. 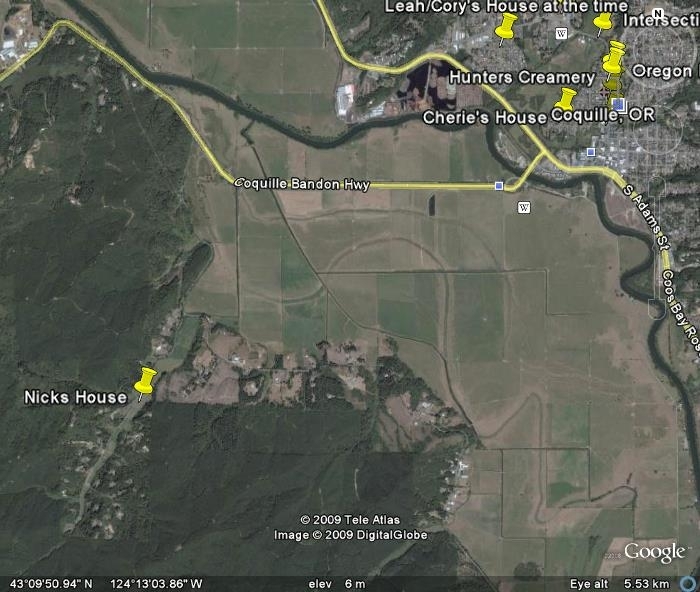 Cory as stated this trip would be roughly 6 mins excluding stopping or talking to anyone so roughly NM would be returning back down Central at 9.10-9.15..
LF seen by a witness passing McKay's Market on Central the witness states she looks angry arms crossed and eyes down..This would place her walking past a telephone and , people have wondered if she rang anyone , Cory felt this was doubtful.. This section of LE notes are very ambigous !! If NM did state this at 11-11.30 we can presume its BB with him , because NM as stated to LE he picked him up at 11.00 ish, i guess Kristen could be with them too...Kristen is a local girl known to NM ,Cory as stated she wasn't a friend of Leah's and that Leah would more then likely be annoyed she was driving around with NM...There are rumors that she was jealous of Leah...Cory as stated that NM told her on the 29th , that Kristen had helped him look for Leah , as well as BB , we have no idea if this was at the same time as BB..... HELP NEEDED ..
NM goes to LF's home, sees a light in her room and attempts to contact her through the window. No response so he goes home ,but doesn't knock or talk to family.. LE (local PD) goes to BB's grandparent's home,(It must be noted that the granparents were on Hols) no one is there. On the deck they see a white men's sleeveless t-shirt as well as beer cans. They do not collect the shirt. LE realizes later LF was wearing a men's t-shirt (“wifebeater”) and return to BB's grandparent's home. The deck area has been cleaned and the shirt is gone. SN interviewed, indicates there appeared to be abuse in NM/LF's relationship, on occasion LF would hit NM and he would strike back, NM has a “flash temper”. Search warrant executed on blue Mustang. Items seized were vacuum sweepings and duct tape end, ¾ inch piece. One roll of film and a partial roll of photos were also taken by the crime lab. Search warrant executed on NM's home and his person. Items seized included mouth swabs, head/pubic hair, 1 roll 35 MM film, red Thunderbird (belongs to his parents), white sock w/ stain, 9 rolls of exposed film, purple women's sweatshirt, 1 package of photos dated 7/1/00, documents/notes/letters, pipes, bongs, marijuana, film canister w/ white powder, miscellaneous drug paraphernalia, marijuana seeds, broken light bulb, modified smoking device, high school annual (yearbook). Tested but not taken, Easton and Louisville Slugger baseball bats. Grand Jury where NM and BB were to testify called off after LF's body found. 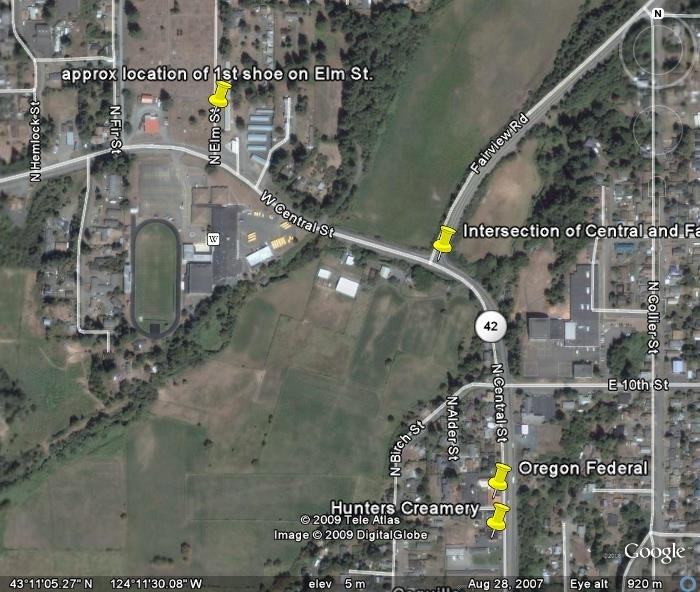 Intersection of Central and Fairview, as well as Elm st. that runs next to the cemetery. This is the approx location of the 1st shoe found by the passerby Gentleman who thought it belonged to his kids. 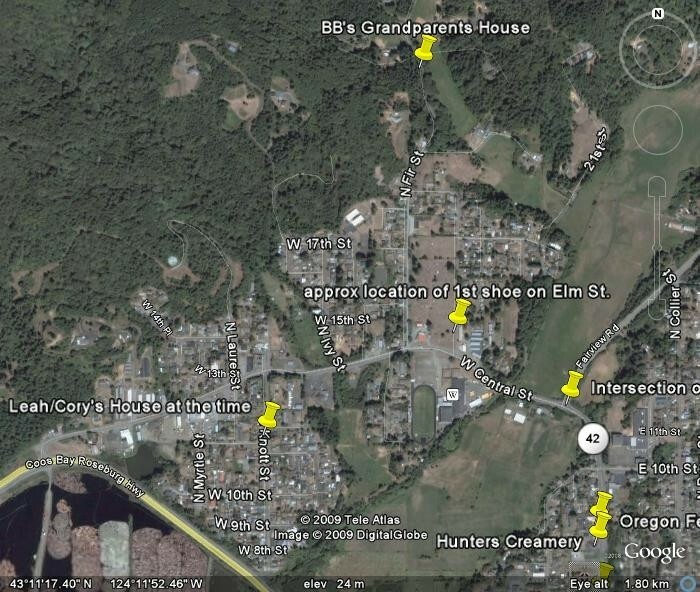 This is a view of the distance between Leah's house, BB's Grandparents and the cemetery. 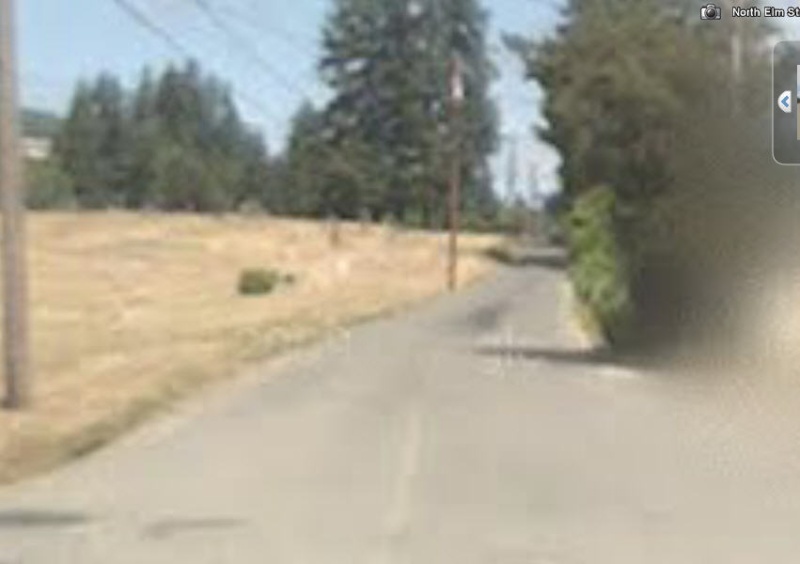 Distance from Nick's house to City of Coquille. Note that Cory has made this drive herself and states that it only takes 15 minutes round trip. 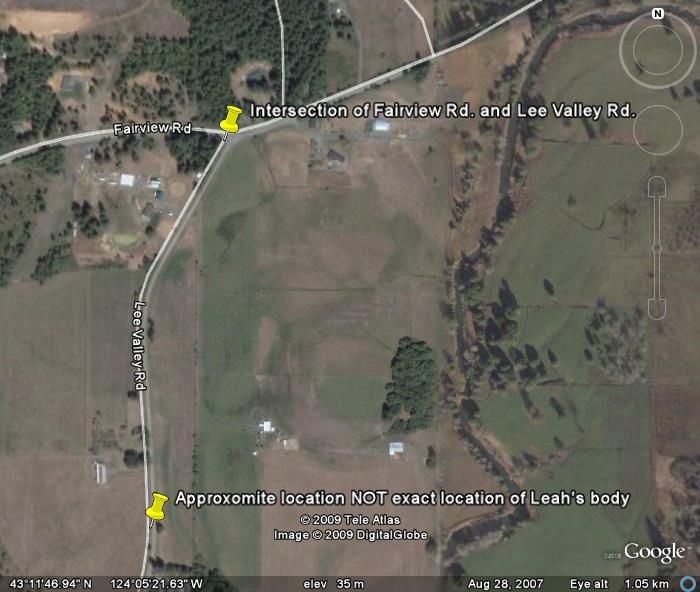 Distance "roughly" between Fairview and Coquille, it is stated that Leah's body was discovered 9 miles out of Coquille. 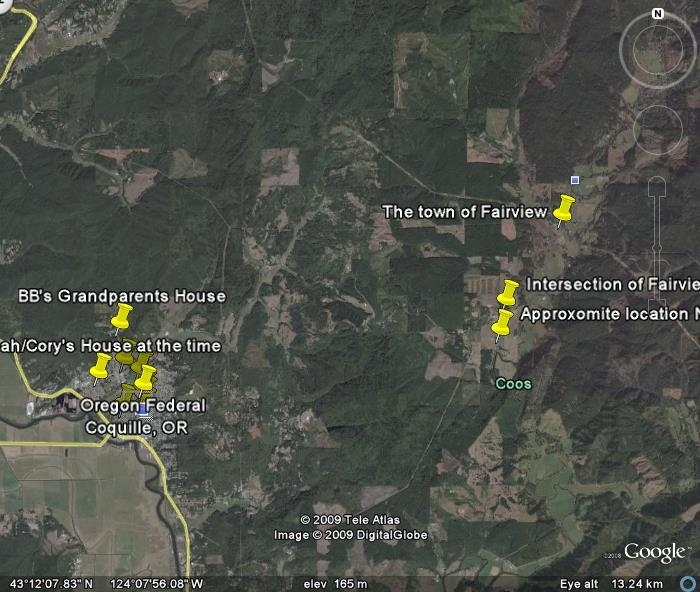 I'm attempting to map some maps using Google Earth. 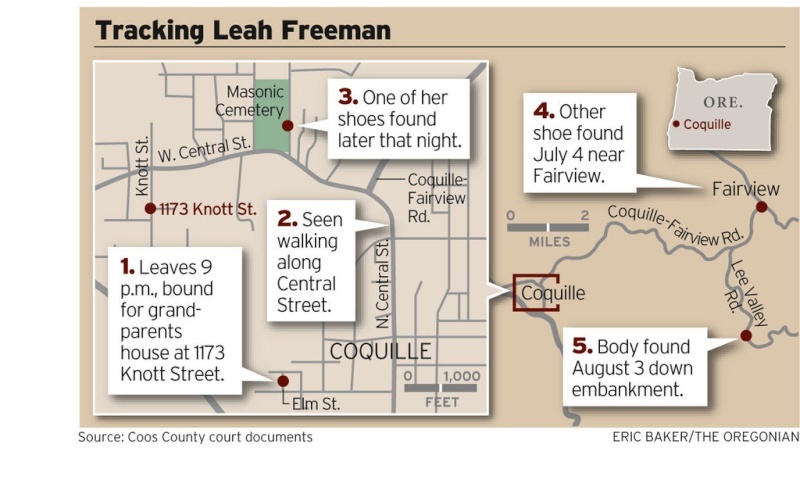 Below is the approximate location on Leah's FIRST shoe being found. 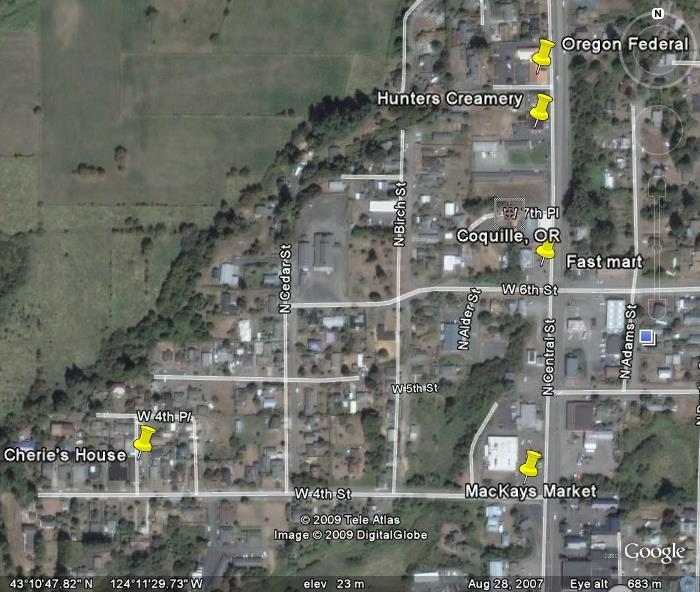 I also did a Zaba search & found the alledged address for TM at that time. It seems pretty farfetched that he would think one of his children lost their shoe more than three blocks from their home (IMO). Here's one just to show what kind of road that it is. Nick didn't seem to have any problem providing LE with a photo of the clothes Leah had on the last time he saw her. Also, WHY is it that when the teacher stated that Leah & Nick's relationship appeared to be abusive...and that Leah would hit Nick...did she follow up with "he would strike back, Nick has a "flash temper""? Shouldn't it be said that Leah had the same "flash temper"? AJ...I want you to know that you are NOT alone in your feelings on this case. I, too, feel Nick never should have been accused. I just don't see him having the time, let alone the composure to be in front of everyone that he faced that night & the days to follow. Hi I’m Andy and I wrote out the notes above for Victim Heartland (well added on to note that were already created). One point, you seem to be implying I didn't want any discussion on the notes, that's far from the truth, we just didn't want them on that thread, due to so many posts going to and fro, and people changing the direction of the threads, I felt that one post with "known facts" and no discussion would be helpful..
As it is I’m not sure how correct the parts about arguing over jogging are now, Sherie has recently made comments that totally change the section about jogging i.e. they had an argument about Nick that evening, and not just jogging etc.. But as far as I know the time scale is correct..
Hi i also wanted to make some comments on your comments, as i work through them..
Firstly the tshirt is a total fox hole, and only been raised by forum members because the Policeman in the pdf file, mentions his concerns , Forum members HAVE NEVER STATED IT WAS 100% HER'S, JUST THAT THE POLICEMAN THOUGHT IT COULD BE. This information was told to Cory by Nick on the morning after Leah went missing, i can only take Cory at her word don't you think ? I would say one more thing, this idea that the LE have arrested Nick solely on community pressure is pushing it... Were talking about 10 LONG years here, surely community pressure would of been at the 1 year mark, its not like they've rushed to do it , is it?? What pressure is at 10 years that wasn't there at the first year? I would of thought it would be a much more measured investigation after 10 years..
Hi Andy...I'm sorry that I gave the impression that you didn't want any discussion on what you wrote. I never meant it that way. I copy & pasted what you wrote. Because it was originally elsewhere, I didn't want to change what you wrote. (I hope that makes sense). Though I personally have my doubts that Nick is guilty...I hope that LE has much more evidence against him & that he wasn't wrongly accused. IMO, that is just as tragic as what happened to Leah. Just from what I have seen so far, that IMO, doesn't seem to be the case. AJ~ Have you ever considered sending some of your thoughts on this case to Nick's defense team? Your thoughts are very well thought out and backed up by fact. Also, they are chronological, which I particularly appreciate. We tend to think (because of TV shows, I think) that defense lawyers run out there to debunk the Prosectution's theory 24/7 until they can prove their client is innocent and someone else is guilty. But that's not true. This seems to be going in the way of so many cases: The prosectution cannot prove a case beyond a reasonable doubt. Their case seems to depend on "If not him, who then?" Under our constitution a person is innocent until proven guilty in a court of law. And we have laws that protect the accused and guarantee them certain rights. I know some people get mad about that, but that is what I think separates the USA from most other places. Everyone has a right to a fair trial under the protection of the law. But it seems that this case is leaning towards: "If you got a better idea, please let us know, otherwise we're goin with Nick cuz after 10 years we don't have anything better to go with and we promised we'd solve this." It is not the defense's job to prove their client didn't do it. It's the State's responsibility to prove beyond a reasoble doubt that they did. I want all of the families here to get the closure they all deserve. And I want justice for Leah. But I just don't think that LE has done their homework here. Of course no one wants a innocent man sat in prison remanded till his court case, its everyone's worse nightmare I'm sure..
As far as i can remember I've never stated that Nicks guilty ,that with standing it is my OPINION hes involved in some way, and in behavior that stopped him being totally honest to LE, which in of itself could cause problems with the investigation. I know EVERYONE wants the right person caught for this crime!! But lets not forget it is the LE that suspected Nick and his friend first, not Cory, shes not jumping on board the whim's of internet sleuth's, shes jumping on board the suspicion of professional LE officers..
quote "I believe you can support someone and disagree with them and try and reason.. It was clear that in this case, if you challenged the opinion .. you were chastised... "
I've had manyyyyyyy conversation with Cory, I've stated a ton of times i wasn't sure of Nicks guilt, but felt he hadn't been entirely honest about that evening , and she never ones was rude or ungrateful for my interest, maybe it was the way you said it?? Hi Andy. I think your timeline is pretty accurate based on the docs. I was already leaning toward Leah making it to Elm, and since 20/20 said she was last seen near the Shell on the corner of Central and Elm, I'm pretty sure she made it to Elm. I think it's very unlikely that Nick drove up and down Central and missed Leah, so I think that he probably missed Leah by more than five minutes at the Mitchell's house. According to Google walking times, it should have taken Leah about five minutes to get to Central via 4th St, and Nick most likely turned onto 4th St from Central on his way to the Mitchell's. It also should have taken Leah about 22 minutes to get from the Mitchell's to the spot on Elm where her shoe was found. I think Nick probably drove down to Denny's Pizza before coming up Central when looking for Leah. The big questions are did Nick catch up with Leah on Elm, or did an unknown perp grab her first? I figure that if Nick picked her up, he could've had her to BB's grandparent's house by 9:30 or to his house by 9:35-9:40. Cory said Nick may have called from the Mitchell's as early as 10:07. On 20/20, Cheri said when Nick came back after 10, he was acting like Leah wasn't coming back. There really wasn't a lot of time for Nick to drive to town in the Thunderbird. I think prosecutors may accept his family's denial that he was in the Thunderbird that night, and are probably going to say that Nick did something to Leah some time between 9:25 and 10. The way I understood things, the reported times Nick was in the Thunderbird were before the first time he was pulled over at 10:30 in the Mustang, and it wasn't LE who spotted him in the Thunderbird. The tshirt is a total red herring !! If we knew what Leah was wearing when she was discovered, it would either cancel or reinforce the tshirt at the house, it seems pointless to speculate about what the LE could easily confirm either way.. I'm also going to but in here & ask.....WHEN would Nick have had time to clean up all the "medium to high velocity blood splatter"????? I disagree but i would!! I have stepped back slightly because i have been concerned about some post... It is true that maybe i overstepped the line in a argument with a young lady (a friend of Nicks) on totally different forum, but i felt she was being totally aggressive to Cory, and refusing to answer anything other then what suited her.. But that is beside the point , i still believe Nick made some questionable errors of judgement that night imo, i have never to my knowledge stated he killed Leah, i have stated i felt he was either involved, or his behavior stopped him being honest with the police.. I know kh, it's a lot to take in. I have been following this case for a very long time. I was one that believed Nick was guilty (at first) until I got to checking on some of the actual "facts" of the case. I would never want to walk in Cory's shoes. After learning more though, I realized how wrong I was & how wrong & unfair that I was being to Nick & his family. About a year ago, someone claiming to be Nicks girlfriend had joined RC. I never gave her a chance. It is something I totally regret. I hope that she still comes here & reads. I hope that she would accept my apology for not giving her a chance to give her side. Albeit, even 20/20s timeline and new and improved stories ..do not facilitate oppurtunity, motive, and evidence that shud have been present..
one more thing "As I wrote, Cory had told me that this shirt was with Leah, and she told me also that she told this to you as well..I do think it is a shame that she did not tell everyone who was posting that the clothes were with Leah.."
one again How was it fair, for some select ppl ( eg. like you and I) to have been told that the shirt was at the scene i have never ever been told this, i can not stress how much this is untrue !!! i have never ever been told this, i can not stress how much this is untrue !!! No i haven't forgotten, that is a lie i have never been told that..
How does being a normal 18 yr old HINDER an investigation???????? What I am scimming over is your absent mindedness..
No your being insulting, that is total bull she never once stated to me Leah was found wearing the shirt that a policeman first thought was at Brent's granparents..
why are you saying he left out things when he talked to LE??? Well for one he was obviously concerned about telling the police he went to the pond, naively thinking they would be worried about weed when their investigating a murder.. I dont care if you forget ... I really dont.. it is redundant..
" I figure that if Nick picked her up, he could've had her to BB's grandparent's house by 9:30 or to his house by 9:35-9:40"
I want to breakdown your thoughts...if its ok..you can reply by quoting and coloring your answers so it is easy to read.. If he picked Leah up in that 5 minute (9:25 to 9:30) window...did a struggle ensue where he had to grab her on the street where her shoe was later found at 11:30 pm? Did she willingly go with him to BB;s where BB and allegedly his g/f were at ? If Nick was the one who picked her up, I think she went with him willingly. If he went to Nicks place..did her parents know that Leah was there? Both places were said to be several acres, but I doubt that he took her to his place, especially if his parents were home. What happened to Leah, that Nick was now back at SHerris after either going to BBs or his own place, and making time to be back at the Mitchells at 10:10?? If I knew what happened, this case wouldn't have gone unsolved for over 10 years, but there was plenty of time for something to happen. We have plenty of cases on this site where people were killed within minutes of the last time they were spotted. The Mitchell's house was only about an estimated 6 minute drive from BB's grandparent's house. I know there were other people at BB's grandparent's house, but there is plenty of property there and there are said to be accessories in this case that won't be charged because of a three year statute of limitations in Oregon. I also read an article that said somebody besides BB was offered immunity. I also want to point out that you seem to be using some stuff from the original timeline and some stuff from 20/20 .. The original docs we saw were less than 50 pages out of the 5500 that now exist. They give approximate times. Hunter's and the Credit Union are a minute apart, but witness reports have her walking in front of those places 10 minutes apart. Also, did Nick show up at Denny's closer to 9:15 or closer to 9:30? It doesn't sound like he was there for 15 minutes. The times I've used aren't out of the realm of possibility. According to the maps, Nick could have left Denny's Pizza as late as 9:24, picked up Leah on Elm, and drove to BB's grandparent's by 9:30. The docs say most people going to the north end of Fir Street will take Elm off of Central to avoid the gravel portion of Fir Street between Central and 18th Street. 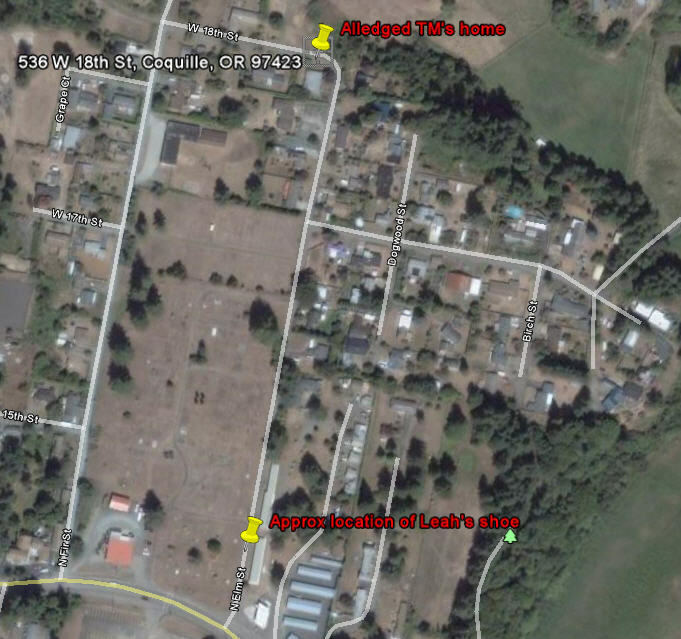 The main things I used from 20/20 were that Leah was possibly seen near the High School and was last seen alone near the Shell. I already thought that Leah probably made it to Elm before watching 20/20. I also used a couple things to show how the case is probably going to be prosecuted, such as statements that Nick was seen with Leah after 9, Cheri's description of Nick's demeanor at 10:10, and the part where Nick said he first went to BB's house at 9:30 before driving the route she would have walked home from the Mitchell's house. Given the family's denial, I think the Thunderbird sighting was a Red Herring. If it wasn't, then the timeline is much tighter and Nick would've had to kill Leah pretty quickly before switching to the Thunderbird, driving into town once, and then switching right back to the Mustang. I'm trying to figure out how it happened if the prosecution is correct that Nick is guilty. It's hard to explain how they cleaned up all the blood without leaving any evidence. I still don't even know the cause of death, so it's hard to say how much blood there was and what caused the blood spatter. I don't know why they are now saying the shoe by the cemetery also had blood spatter. The docs didn't say the shoe by the cemetery had blood spatter, but I don't think they specifically said that it didn't. I'm not sure if your IP will let you stream the show from here, but if it will, here are a couple links where you can watch. To watch at our link, you need HTML enabled in your profile. Damn AJ, I don't know how in hell I missed that! I would think that alone would make a jury pause (IF pointed out by the defense) and say WHAT? Two shoes get sent off. One has blood, the other doesn't. Then the report comes back & the WRONG shoe HAS blood??? The shoe that was NOT turned in for days??? Things that make you go hhhmmmm??? (Damn, I feel like an idiot! HOW on earth did I miss that??? I don't know how many pages of the 5,500 are from the last year, but to start I would really like to see the original lab reports and the transcripts of all the witness interviews that were conducted back in 2000. Im not sure why you are assuming that Nick didnt tell LE he was at the Pond... ? A sentence was pretty visable and said Johnsons Pond so I am assuming Nick did tell them he was there..
Im not entirley sure what point you are making... ??? It is posts like this one by you, below that make my point ... Cory i was being slightly sarcastic about him , i think he's totally guilty of something that night , just not sure where we stand saying that on a public arena..."
Ok please bare in mind i'm 5 hrs ahead of you, if i'm a little slow..
Aaron West, David Jenkins and Josh Emler at the pond stated he left the pond in a Mustang but they later saw him in the Thunderbird.. I noted earlier i regretted getting into it with his friend on CSO forum, do you have a link for that site i cant seem to find it.. I'm pretty sure she stated something about the car, but i want to read it before i post it here..
Hi on page 4 line 14-21 Nick in a interview with LE outlined what he did after dropping off Leah at her friends, there is no mention of the pond..
Of course that doesn't mean he didn't mention it elsewhere..
prayerbone, CSO is no longer. sitemama wrote: prayerbone, CSO is no longer. KH, CSO is the site some of us belonged to before Fysty and J4a started this site. That is the site I originally met Cory and prayerbone on. Q. Did she willingly go with him to BB;s where BB and allegedly his g/f were at ? A. If Nick was the one who picked her up, I think she went with him willingly. J4.. So how did Leahs shoe get to that area???? If he was gonna plant the shoes.. (toss them) ..why wud he tbhink to place them so far apart????? knowing that one was relively close to her remains??? Also, I wont disagree with you that murders apparently can happen very quick..the prob is that you have to look at the whole ppic..
We know Nick is an emotional guy where he pretty well wears his heart on his seeve.. we have even seen it..
How cud he have pulled off this murder/act and still be composed and clean and be back in town all in 30 minutes from your suggested timeline??? and smart enough to leave a shoe????? if you inject some logic.. it wusd seem more likley that Nick was maybe apprehensive about calling Cory...like I have said before.. maybe he knew something that had been going on in the house.. maybe he didnt want to get leah in trouble with cory.... there cud be understandable reasons that wud explain this..
knowing what we do which is..
we have seen the very few docs from le from 10 yrs ago..
On account that we have seen very different stories and timelines... it wud be plausible to think that the accuracy of the beginning docs is the case.. If you are suggesting that there werent enoough docs way back..and the ones they have now are more accurate.. i wud prolly disagreee whole heartedly.. I can't really figure out a good reason why the shoes were dumped in two different places unless the perp wanted to make it look like she was snatched from Elm and possibly killed at Hudson Ridge. It would help to know for sure whether the shoe on Elm had blood or not. If it had blood, it makes it look more like it was planted since no other signs of blood or a struggle were found on Elm, at least not based on what was in the affidavits. I tried to pull out information from 20/20 that makes sense with what we know. I haven't even tackled the stuff with Kristen yet. There was mention of him at Kristen's house around 9 and around midnight if I remember correctly. I would like to here his statement about Kristen, and about the time he spent with her that night. My scenario with Nick missing Leah at Cheri's by more than five minutes and driving to Denny's Pizza first is the only one I can come up with where Leah would have even made it to Elm without Nick finding her. Whether she was snatched by someone else before he would've caught up with her is the big question. Works both ways ;-) Aren't u as guilty as others, of surmising??? Do you think it is possible that he has no guilt whatsoever? Im wondering if you wud agree that strength is in numbers in net and the community? I'm interested in this view of a community totally behind Cory,when at the yearly anniversary at most 40 people turn up ?? Why do you feel that Nick must have some guilt? Leah allegedly argued with him that day, and her personality at Sherie's was argumentative, it as been stated online she now says they argued about Nick as well as jogging. He allegedly stated to Leah's sister they had argued, which you dismiss, but we must remember this statement by Leah's sister was made close to the events and bares out what Leah had said to Sherie..
Why when u know ur lift is coming at 9 do you decide to walk home? Why when your lift is coming do you want to go running? I think the biggest question to be asked in this case now is: Does the prosecution have enough evidence to prove Nick's guilt? And the answer is: We don't know. I've read a lot of the posts here and have some comments. 1. With so little information released in the case, we can only speculate. Seems to me that law enforcement has done a good job at keeping the lid on the facts of the case. Hearing rumors or reading conjecture on the internet is not going to taint an entire jury pool and Nick will get a fair trial because that's what the legal system guarantees him. 2. A lot of the questions posed here are remedial and would be addressed by any district attorney worth his salt before going to trial, like the shoes, investigating the victim's family members and any similar murders, etc. 3. The idea that a witch hunt led by the victim's mother resulted in the unfair arrest of Nick is ludicrous, in my opinion. To me, her being on the internet with her opinion is no different than anyone here posting their opinion. 4. There is a reason that Nick was arrested and is now facing trial, and I don't think in any way that it's a huge conspiracy. I'm betting it's his own actions that got him where he is. Will a future juror read here and decide that Nick is guilty or innocent? No. They will do it in the courtroom where it belongs, based upon evidence. Circumstantial cases are tried every day in America. The postings here make it clear that there can be two sides to every story, which is why we have a prosecution and a defense in the first place. Its you who mentions masses of people and i responded purely to that question and showed your totally wrong ...But you cant considered it, no you have to go on another rant about those 50 know another 50 and wow before we know it its a army GET A GRIP ! !